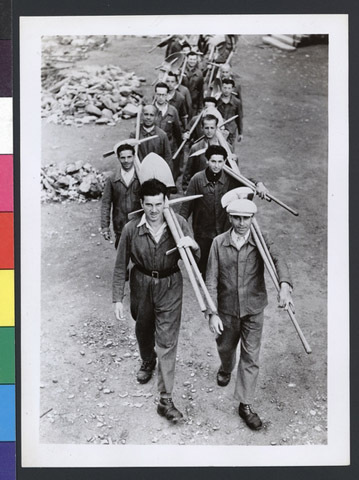 JDC - Archives : Refugee men walking in two lines carrying picks and shovels. Title Refugee men walking in two lines carrying picks and shovels. Description German refugees in two lines carrying picks and shovels. After France fell to the Nazis, many German Jews fled to Switzerland, where they were housed in special optional labor camps.